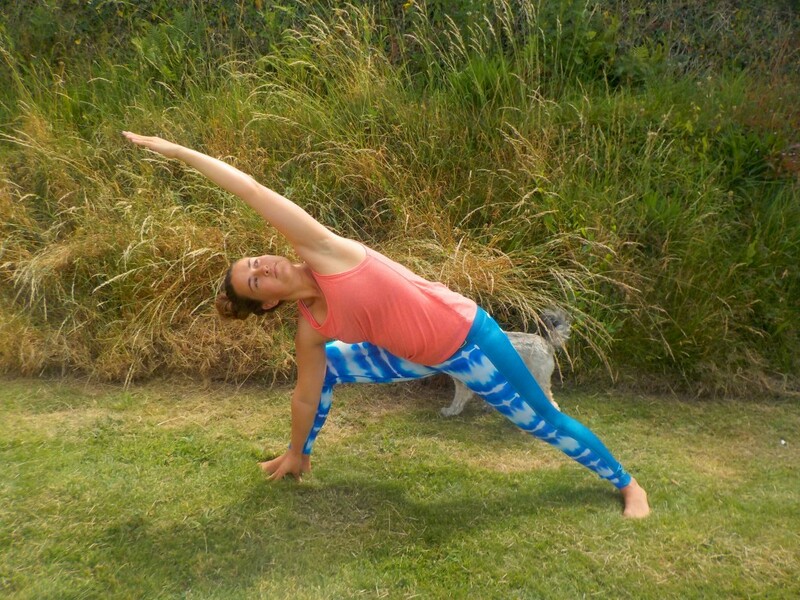 This Vinyasa Flow sequence is a taster of the sequence I’ve been teaching in my yoga classes this week. It focuses on your side body, an area that can hold a lot of tension, often without us realising! Using this Vinyasa Flow sequence to open your side body is going to help you to cultivate spaciousness in your upper body and breathe more freely, easily and deeply. After this sequence you may feel taller and lighter – you will have stretched out your back as well as your sides in the most fantastic way. And the best thing? Side body opening cultivates deep serenity. I’d love for you to leave a comment at the bottom of the page and let me know what you thought once you’ve tried this sequence. Warm up with a few rounds of cat and cow and some sun salutations. Then complete one round of this sequence (both sides) holding each pose with a (5) next to it for 5 breaths. Now its time to speed it up and try flowing with your breath between each pose like in the video below. Don’t worry if you can’t master it straight away or match the breaths exactly – just go with the flow and keep breathing deeply. Do this as many times as it feels good. 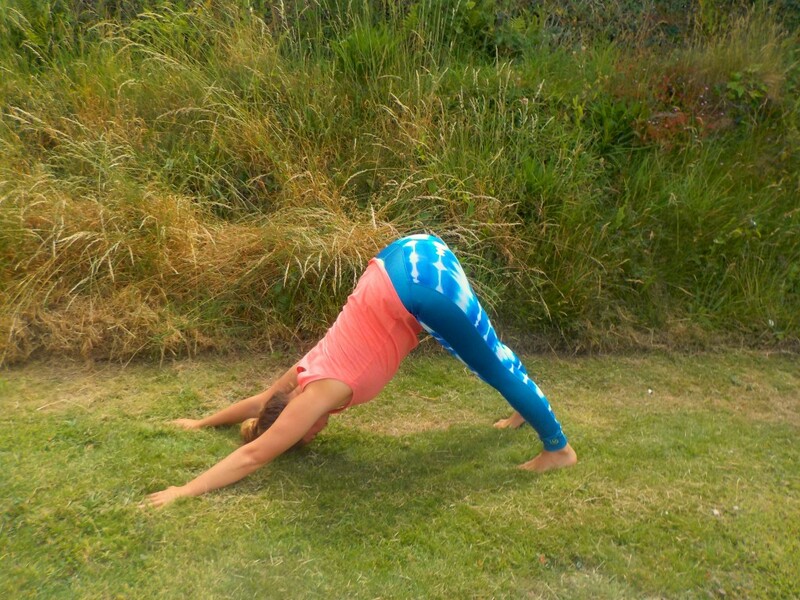 Begin in Downward Facing Dog (5). 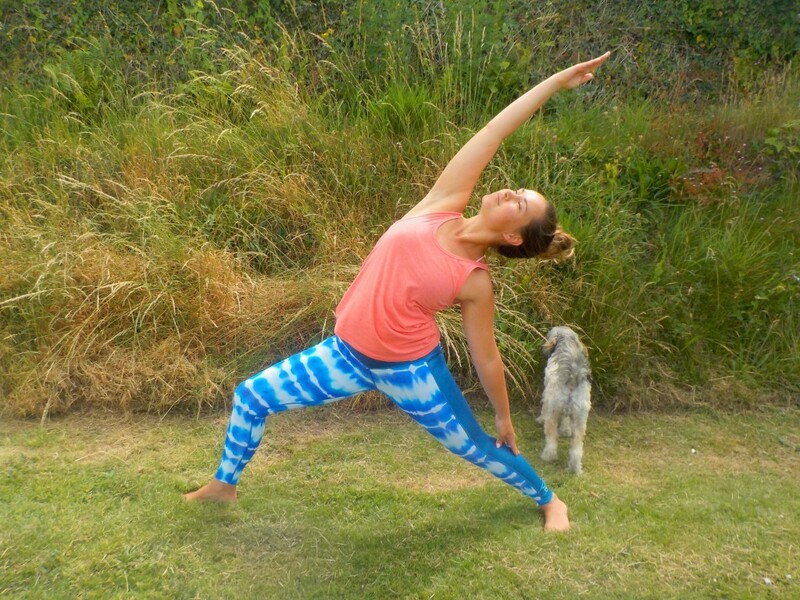 As you breathe in sweep your right leg up towards the sky and in to Three Legged Dog. 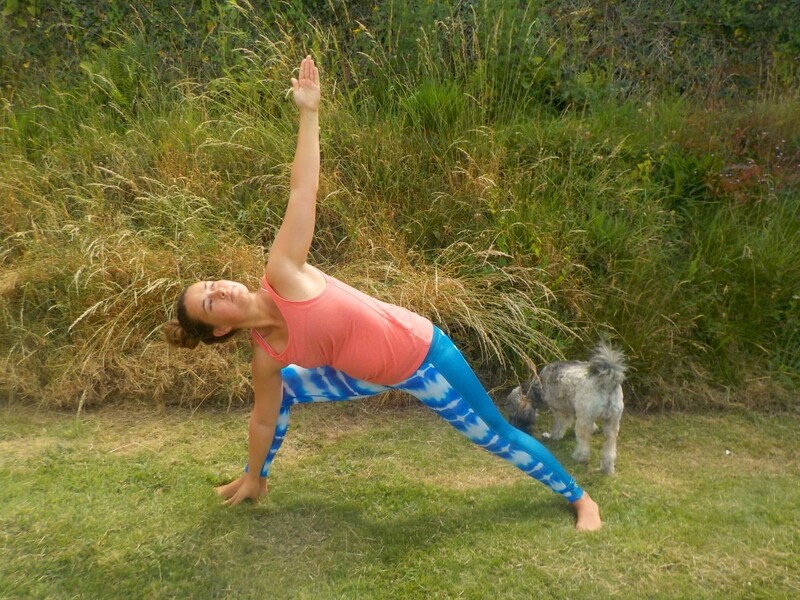 As you breathe out bend your right knee and roll your right hip open in to Bent Knee Three Legged Dog (5). 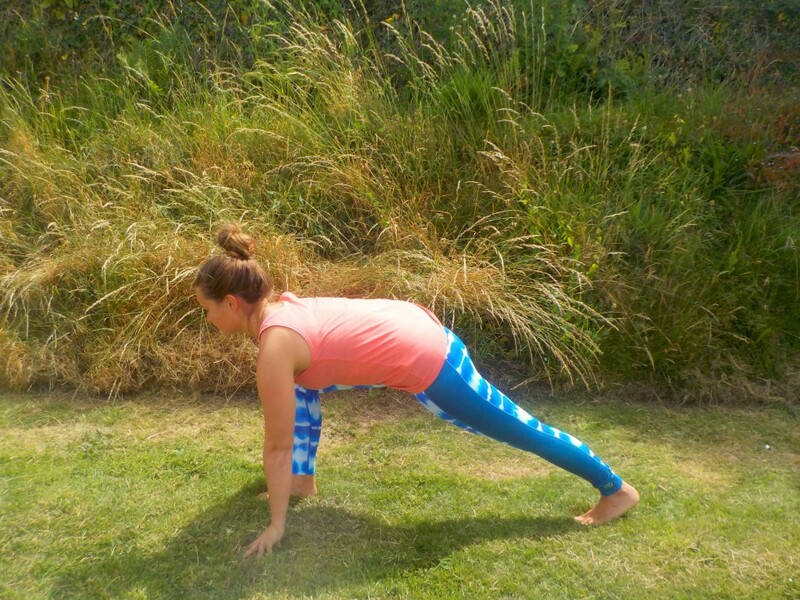 Inhale to lift and lengthen through your right knee as much as you can whilst keeping your shoulders even. Focus on creating as much length as possible down your side from your right arm pit to raised knee. You can look over your left shoulder and see if you can see your right toes! As you exhale step your right foot all the way between your hands. Inhale and straighten your front leg. Bring your back heel to the floor with your back toes pointing in about 45 degrees. Windmill your arms up and over head. Take your back hand to rest on your back thigh, reach up and over with your front arm in to Reverse Triangle (5). Gaze up and focus on lengthening through your front body as much as you can. 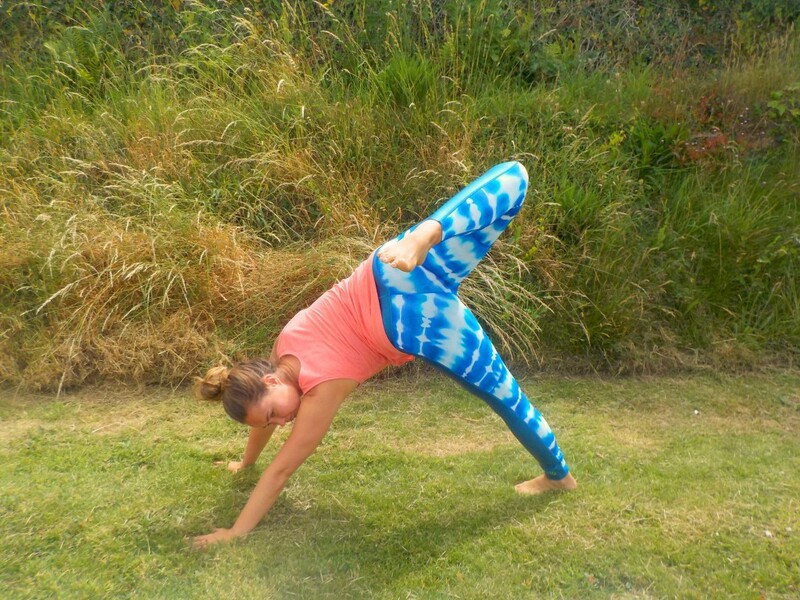 Keep the length through the front of your body as you exhale reach forward taking your front hand down to your front leg and reaching your left arm straight up in to Triangle Pose. With an inhale circle your left arm up and over your ear. 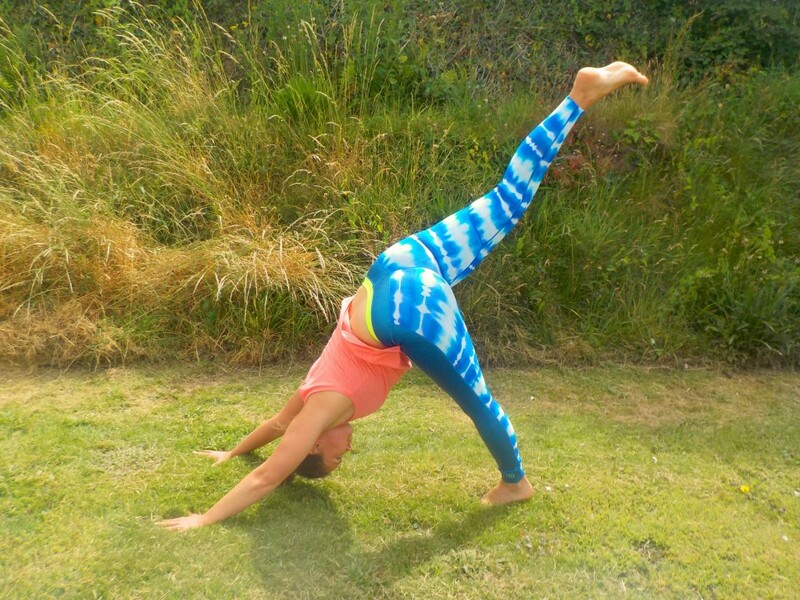 Reach past the front of your mat and fan your left ribs toward the sky for Extended Triangle Pose (5). 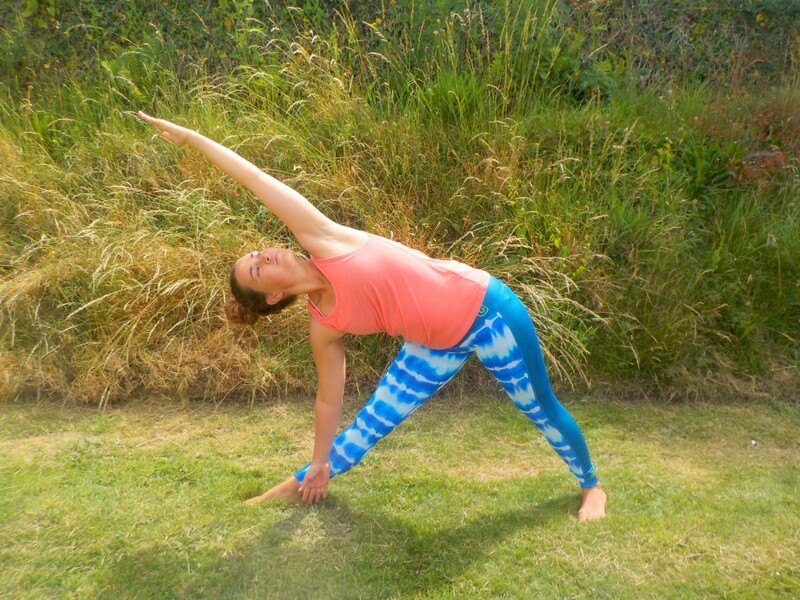 With an exhale bend your front knee, bring your shoulders over your hips and take your arms parallel with the floor for Warrior Two Pose (5). 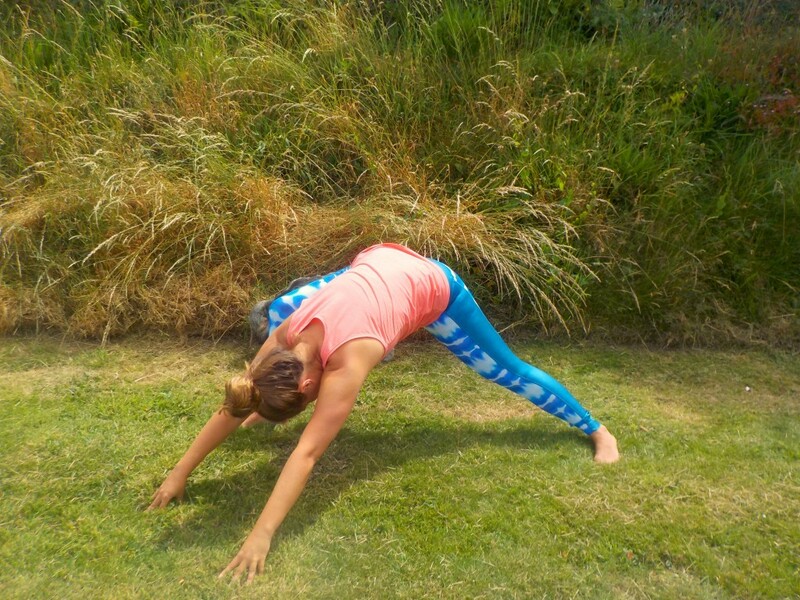 Breathe in and keep the bend in your front knee drop your left hand to your left thigh. At the same time reach your right arm up and over in to Reverse Warrior (5). 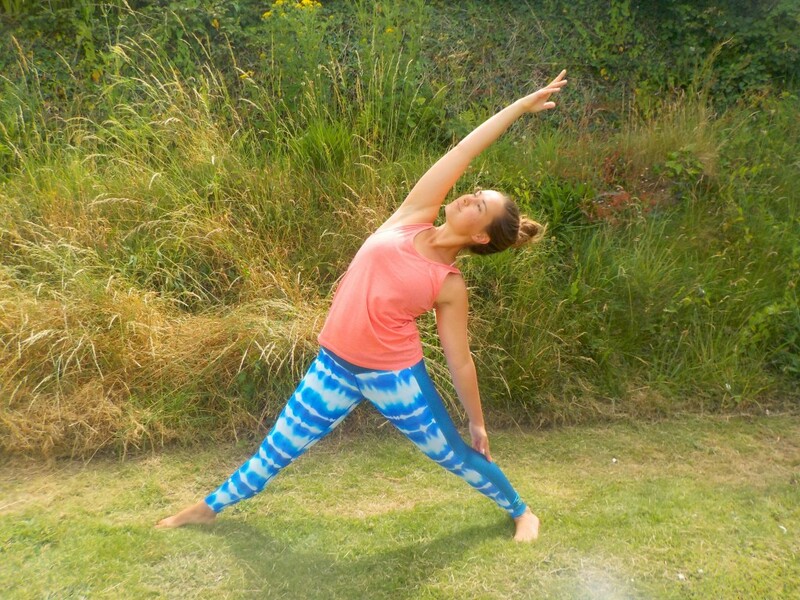 On your exhale take your right hand down to the inside of your right foot and reach your left arm straight up in to the air in Side Angle Pose. With an inhale circle your top arm up and over your arm. 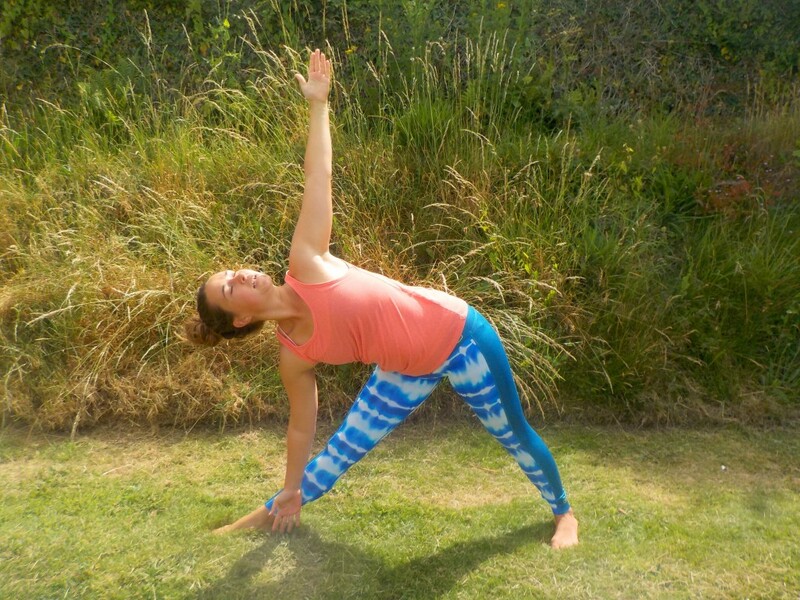 Reach past the front of your mat for Extended Side Angle Pose (5). Exhale and bring your left hand down next to your right. 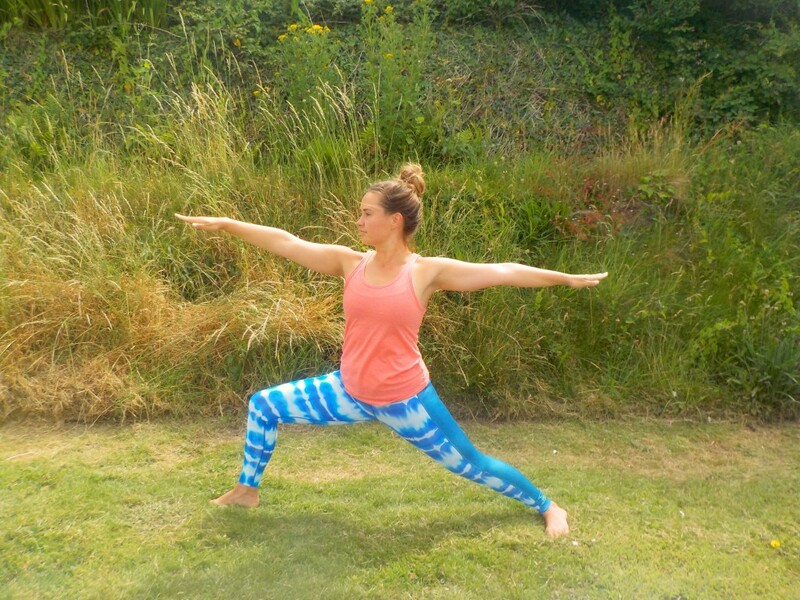 Walk both your hands as far away from you out on the diagonal as you can and come in to Side Warrior Pose (5). Inhale and lengthen your arms and back like you’re doing Downward Facing Dog through your upper body. Don’t move your lower body though. Exhale and bring your hands back to either side of your front foot in to a High Lunge, then step back to Downward Facing Dog. Repeat on the left side. Here is a simplified list of the poses with the breath count which you may find useful when you start to move more quickly with your breath. Just keep moving and breathing and don’t worry about making it perfect! I love putting on some really upbeat and uplifting music to help me flow. Don’t forget to leave a comment below and let me know how you felt after trying this sequence!